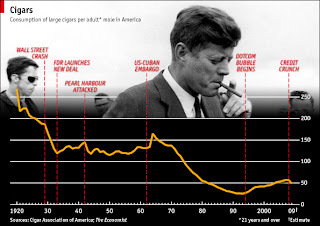 As the DotCom bubble began to inflate in 1994 the per capita cigar consumption of adult American males began to rise for the first time since the Kennedy administration. Before long this resurgence began to stimulate demand for accessories such as humidors as well. Like many custom furniture makers the idea of making humidors was completely in sync with any other type of fine woodworking. 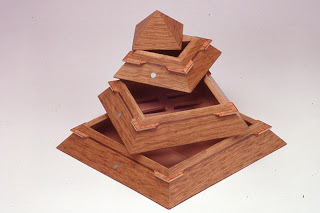 The most common type of design was the simple lidded box, with an exterior clad in a fancy exotic wood (usually finished in high gloss) and an interior lined in Spanish Cedar. The most difficult part of this process usually involved finding high quality hardware that was of a level consistent with the quality of the box itself. 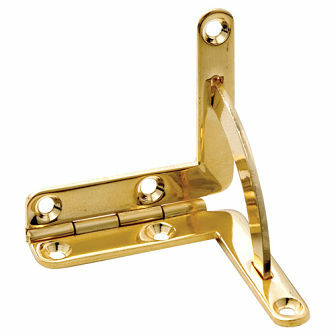 In my case I could never settle for anything less than finely machined quadrant hinges plated in 18K gold. Simple rectangular boxes were, frankly, quite boring to make so it didn't take long for me to seek out new challenges. Soon I began to experiment with alternative shapes such as this pyramid design. 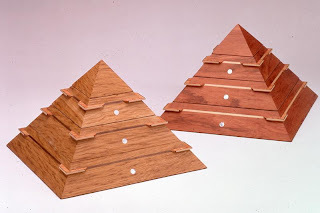 By the time this Pyramid Humidor came together I had managed to fine tune my signature detail of using cigar shaped ventilation slots in the bottom of the trays. By 1998 it was time to set the bar higher again with the Diego Humidor. By now I was looking to create a cabinet that would allow for both individual cigar storage as well as storage for complete boxes of cigars. Of course the biggest challenge for such a concept was going to be humidification and ventilation. This was addressed through the use a commercial grade humidification system set on a slide-out tray built into the center of the cabinet. 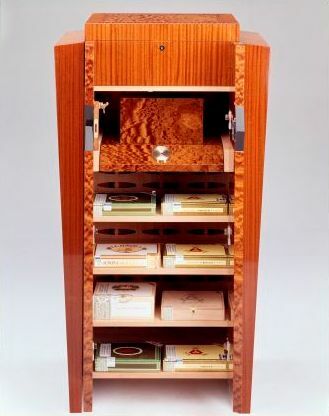 The cabinet was designed with a double wall back panel (with cigar shaped cutouts for ventilation) to allow for complete circulation of humidified air throughout the cabinet. The underside of the top features a sunburst inlay of Spanish Cedar, with the top pivoting on inlaid quadrant hinges plated in 18K gold. In addition to a removable tray this upper storage area also has custom inlaid pockets for a cutter and lighter. The lower part of the cabinet has a pair of thick double doors inset with a diamond shaped medallion and inlaid escutcheon lock. Adjustable shelves made of Spanish Cedar allow for great versatility in customizing the storage space below. 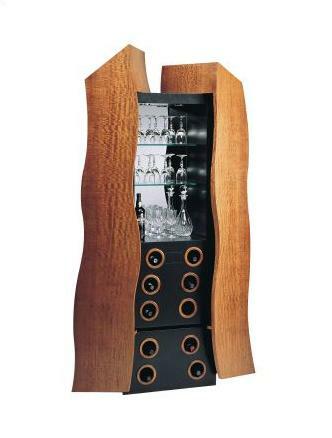 The doors were finished in high gloss Pommelle Sapele, while the cabinet exterior was high gloss Ribbon Sapele. 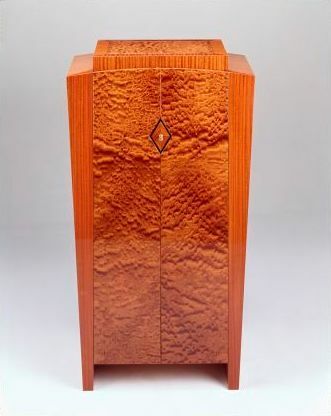 On the very top of the cabinet an inset of figured Pommelle is framed with crossbanded Ribbon Sapele, offset by an inlaid purfling of Mahogany and Indian Ebony. As with all of my pieces the back is fully finished. Overall dimensions: 27-3/8" (69.5 cm.) wide x 18-1/4" (46.5 cm.) deep x 49-3/4" (126.5 cm.) high. The Diego Humidor was unveiled at the 1998 Toronto Wine and Cheese Show as part of an exhibit that included the Andiroba Wine Cabinet. 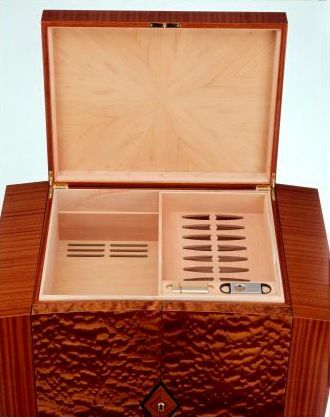 Subsequent to this the Diego Humidor went to Miami where was displayed at the Carriage House showroom. It is now part of a private collection in Brunei.